The Defence Headquarters has blamed the pockets of Boko Haram attacks in Borno State on the information the insurgents get from informants. 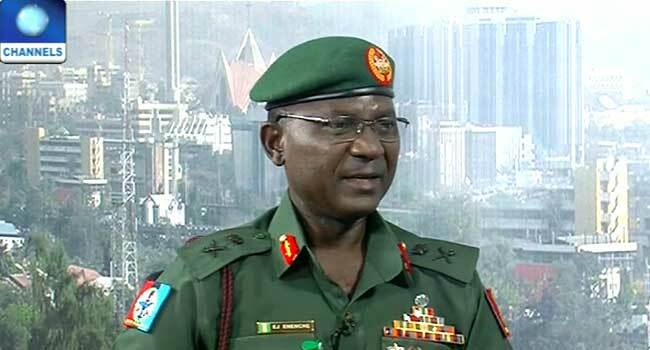 The Director of Defence Information, Major General John Enenche, stated this on Monday on Channels Television breakfast programme, Sunrise Daily. An exploration team – including five lecturers of the University of Maiduguri, about 15 soldiers, 11 members of the civilian JTF and some staff of the Nigerian National Petroleum Corporation (NNPC) – was ambushed by the insurgents on Tuesday last week. Reacting to the attack, Major General Enenche noted that unless the terrorists were given adequate information about the progress of the exploration exercise, the team would not have fallen into the ambush. “These things happening now are information bound strongly and I still want to state that there are informants, there are still collaborators who are collaborating [with the terrorists]. How come they did not attack them on the first day when they started the exploration exercise with the soldiers [until] when they have finished and are going back?” he questioned. The DHQ spokesman insisted that some people must have been monitoring the oil workers and their escorts, stressing that conspirators ensured the attack on the team was successfully carried out. He, however, called on the public to support the onslaught against the insurgents by availing the military with useful and prompt information to wipe out the terrorists. “What is an ambush? You conceal yourself, pass through people, hide your weapons and waylay them; that is it. So it is the work of conspirators and we need the cooperation of the people seriously. “These people that ambushed this team did not just come from the sky, they passed through people and they got information. Some people must have told them [monitor them (the team), they are moving from here to there] and they are collaborators”, he added. The major general noted further that the insurgents are not back in full force contrary to reports and called for more information on fleeing terrorists in order to completely rid them of the region. “It’s not full force; if they were back full force, they would have been controlling territories. They are not back full force but we need information to begin to clear them until we clear them completely”.